Please check all pages for new information, this website has been updated on September 17, 2007 and will be updated as much as possible from now on. We are the Tuffsy Crew and we are Ms. Tuffsy fans. 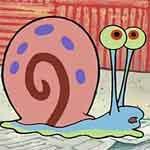 Ms. Tuffsy is Gary when he is lost on Spongebob and an old hag found him and named him Ms. Tuffsy. We named a kid at our school this because he spelled tough, "tuff". Buy one bushel of corn from your favorite corn store. www.corn.com, 1-800-Get-some-corn. Remember that a kernel of corn a day keeps the you-know-what away.